Ecosystems that have evolved over millennia are bound to be as complex as the most intricate tapestry, with interrelationships and connections that might not be readily apparent amidst all the color and noise of the larger pattern. As with a tapestry, pulling on one thread, or even two or twenty, might harm a small part of the picture but the tapestry itself would remain intact. As it turns out, some ecosystems might be more akin to a fragile piece of lace. A channel billed toucan perched on a forest palm. In a study published in Science, researchers examined 9000 seed samples taken from 22 palm plant populations in Brazil’s Atlantic forest. Palm plants seeds are large and tough – the bigger the seed, the more likely the resulting palm plant will be robust. 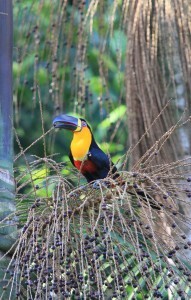 The only creatures able to carry and distribute these large seeds are the large indigenous birds like the toucan. And with the decline of these birds due to habitat disappearance and hunting, the palm plant populations are changing. Trees that are growing now produce smaller seeds, smaller trees, which in turn produce smaller seeds. The smaller palm plants that result from smaller seeds might, in the long term, be unable to help sustain the tapestry of life which depend upon their presence in the forest. This relationship between large seed distributors, large seeds and the forests that depend on them has been studied in other regions, notably with elephants in Congo rainforest. There will undoubtedly be some kind of forest remaining even without large birds and palm plants, much as there is still a tapestry even if several threads have been unraveled. My question is, which thread is the Brazilian Atlantic forest in the overall Earth tapestry, and what unravels if we lose it? There was a good book on this general topic a few years back called Ghosts of Evolution (can’t remember the author). It was full of examples of fruits/plants that used to be processed by large megafauna (such as the avocado). Since the megafauna are gone, many of these species live on only through human cultivation. Your modern example fits right in with what we have seen happen already over the past 10,000 years. Thanks – always enjoy your posts.